A model township for the IT Special Economic Zone, Vadodra, Gujarat, India. Photo courtesy of Skyscraper India. India is rapidly urbanizing. From 1991 to 2011, the urban population in India has increased from 100 million to 200 million. By 2041, 50-percent of India’s population is expected to live in cities. On average, the population of India’s six major metropolises nearly doubled betweem 1981 to 2001, while the number of motor vehicles went up 775-percent during the same period. The lack of adequate infrastructure and services to accommodate this rapid growth has been recognized as one of the most important roadblocks on the path to rapid, equitable and sustainable growth in Indian cities. Both the local and national governments in India are struggling to find mechanisms to accelerate the supply of infrastructure and services to meet the demands of unprecedented surges of urbanization and with it, motorization. These growth patterns have created a frenzy in the housing sector, which contributes up to 6-percent of India’s GDP. In 2007, the National Urban Housing and Habitat Policy (NUHHP) identified a housing shortage of 24.7 million units at the same time the real estate market is forecast to grow 30-percent over the next decade. To meet the gap in housing, and to cope with inevitable urbanization, the NUHHP recommends a regional planning approach, which involves “New Integrated Townships and Greenfield Developments” as opportunities for planning and regulating large urban growth. 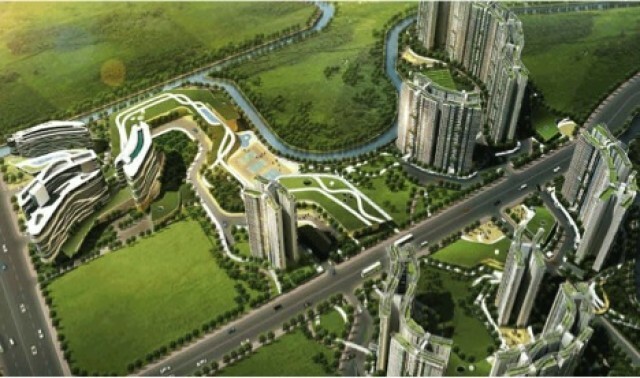 Currently, most visions for urban India resemble the image above – a 550 acre Special Economic Zone integrated with residential, commercial, retail, and civic amenities with broad roads, disconnected by large green expanses fenced by high boundary walls, that would frame the everyday pedestrian experience. From a developer’s perspective, these townships are much easier to build. Private township development policies require simpler procedures to acquire land, and reduce the time needed to do so. Land is cheaper, and labour costs for construction are lower. Consequently, the housing produced is relatively more affordable and is seen as a quick solution to the housing gap. These utopian style developments do not achieve high levels of transport integration, nor walkability. The conversations that become urban form are not only failing to recognize these needs, but also lack nationwide coordination. Development Control Regulations (DCRs), the harbingers of master plans, occur at the local level. DCRs are too often used as tools to re-regulate the already built environment and lose their value as comprehensive plans to low local capacity, where planning is most critical. Neighborhood level planning is key to providing a supply to what are actual local demands for comprehensive transport needs. EMBARQ India incorporates sustainable mobility EMBARQ India has worked on projects incorporating sustainable mobility in housing projects through a bottom-up approach, defining sustainable mobility as the “development of infrastructure that enables and promotes travel by walking and bicycling, mixed land uses, public space creation, and connectivity to public transport” Housing projects incorporating principles of sustainable mobility can reduce motorized travel and result in up to 30-percent reductions in emissions and fatalities. Hence, designing the built environment to incorporate non-motorized transport makes sustainable transport more competitive with individual motorized transport, capitalizing on all the non-work related trips. EMBARQ India has worked with two developers -one in Ahmedabad and the other in Bangalore- on pilot projects that demonstate the tools required to inform, reimagine and build these developments as socially inclusive and accessible living environments. Both developments, Godrej Garden City Integrated Residential Township and Adarsh Palms Retreat Integrated Residential Township respectively, were retrofitted by their developers upon EMBARQ’s recommendations after a basic inspection found cost-effective, achievable recommendations for improvement. This approach has measurable, real world impacts, and given the extent of on-going housing development, it needs to be vigorously capitalized upon. When developers instead cater to the demand for residential, un-walkable, gated communities, the dissonance between perceived safety leads to a negative feedback loop of declined walkability, decreased personal security and a declined public experience. Re-imagining the township and urban development generally are critical to creating a sustainable, equitable and accessible urban future for India.